➢ “She hasn’t yet zapped a Dalek in anger but Jodie Whittaker is already the most controversial Doctor Who ever. The Time Lord enthusiasts in a tizzy over the casting of a woman in the incredibly heavyweight role of a space adventurer who lives in a big blue box could do worse than put away their replica sonic screwdrivers and watch Whittaker in one of her final pre-Tardis appearances. 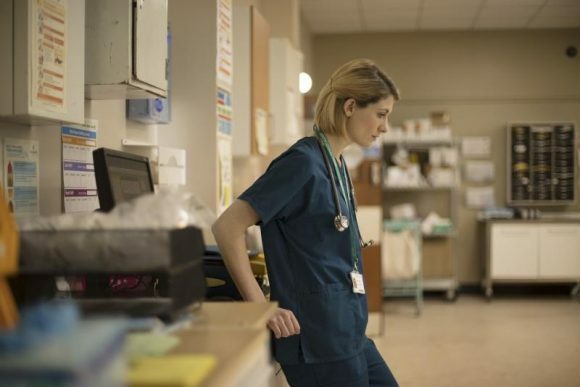 In psychological thriller Trust Me the actress plays a nurse passing herself off as a casualty ward medic: a Doctor-Who-Isn’t, if you will … Whittaker was cooly sublime but the drama assembled around her was often as rickety as a dodgy nose job. ” — The Telegraph. ➢ “It’s not the subtlest or most nuanced of hospital dramas; it’s straightforward and well-signposted almost to the point of clunkiness. Closer to Casualty/Holby than Jed Mercurio’s dark, masterly Bodies. As for Whittaker, there aren’t many clues here as to what kind of Doctor [Who] she will make. She is warm and watchable, as ever, but this part doesn’t give her the opportunity to show the wit that I hope she will bring to the Tardis, and which that role requires.” — The Guardian. ➢ “The problems with this plot came teeming so hard into my head that I couldn’t pay proper attention to the drama unfolding before me. The suspension of disbelief didn’t come … However, right at the end of this first episode of four, the writers redeemed themselves by having precisely these questions come teeming down hard on the head of the hapless Jodie Whittaker/Nurse Hardacre/Dr Sutton. She started to crack under the mountain of fibs, and her competence as a doctor starts to be undermined.” — The Independent. ➢ “Successful women are more prone than anyone to suffer what psychologists call Imposter Syndrome — a nagging feeling that they don’t deserve their jobs and are about to be found out. Trust Me delivers a clever twist on that insecurity. [Whittaker] plays Sister Cath Hardacre, a nurse with 20 years’ experience on the wards, who makes a fresh start . . . by posing as a doctor.” — Daily Mail. ➢ “Watching Trust Me is a stressful experience. That may sound like a bad thing, but it absolutely isn’t – because BBC1’s new psychological drama has been intentionally designed to flood you with second-hand anxiety and leave you on edge. The tension is so thick you could cut it with a scalpel … Surprising numbers of impostor doctors have managed to work in the NHS – sometimes for years. It’s more plausible than you’d think.” — Radio Times.